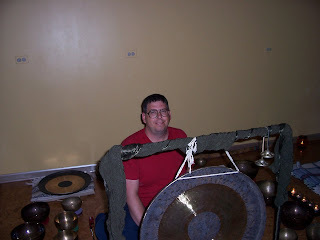 On July 18, 2009 the Circle of Compassion Meditation Group of Naperville, Illinois, USA hosted a fund raiser for Lokenath Divine Live Fellowship. The event raised over $1,000 for Baba's Mission's work. 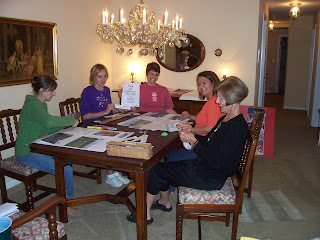 Members of the Circle of Compassion Meditation Group prepare for the benefit the night before. 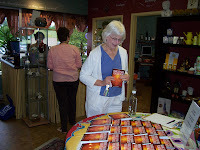 Here one of the participants gets ready to purchase a copy of Baba's book Making Your Mind Your Best Friend. 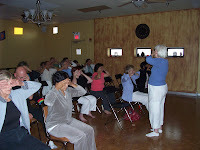 One of the members of the Circle of Compassion Meditation Group demonstrates the breathing and relaxation exercises that Baba taught to the group when he visited last May. 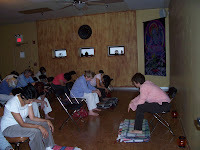 Another member of the Meditation Group led all the participants through several yoga poses based on Savroopa Yoga. The evening ended with a wonderful Gong Bath where 30 bowls and a gong was played while the participants joined together in Meditaton. "It is lighter music, deeper contemplation and united prayer that would create the ripples both inner and outer which would individually and collectively helpful." During this beautiful evening there was plenty of this, and all were blessed, both the receivers and the donators.